Bombings and mass shootings have quickly become a terrorist favorite, and it is easy to see why. The seemingly unpredictable acts are on the front page of every news section and covered extensively by the media. Graphic depictions of the violence are prevalent in our internet-connected age, and these atrocities are burned into our collective memories. Live video feeds and social media have only amplified the message the shooters and bombers are trying to send. These events strike fear into the public’s heart and easily disrupt society on local and global levels. Oklahoma City, Sandy Hook, and Columbine- all of these attacks have become permanent fixtures of our culture and are not forgotten to our memories. Each attack leveled on innocents reminds us of the ones that came before and the persistent evil and danger that exist in this world. This is one of the base reasons a prepper is driven to prepare, and being able to combat a bombing or mass shooting is a noble calling for a prepper to answer. Bombings and mass shootings are usually limited to moderate severity. 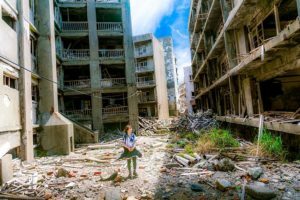 Despite the many deaths that can occur, the majority of the damage is the public psychological impact, due to the widespread reach media provides. The bombing or shootings themselves are almost always isolated incidents and directly affect a limited number of people. Not with the general consensus of the meaning of TEOTWAWKI. But bombings and mass shootings and terrorism in general have changed our world slowly but surely. Our society has already evolved for these threats, with security checks commonplace at most public gathering places. You could argue that it has “ended the world as we knew it” in a figurative sense, but it is more of an adaptation or change that society has gone through. 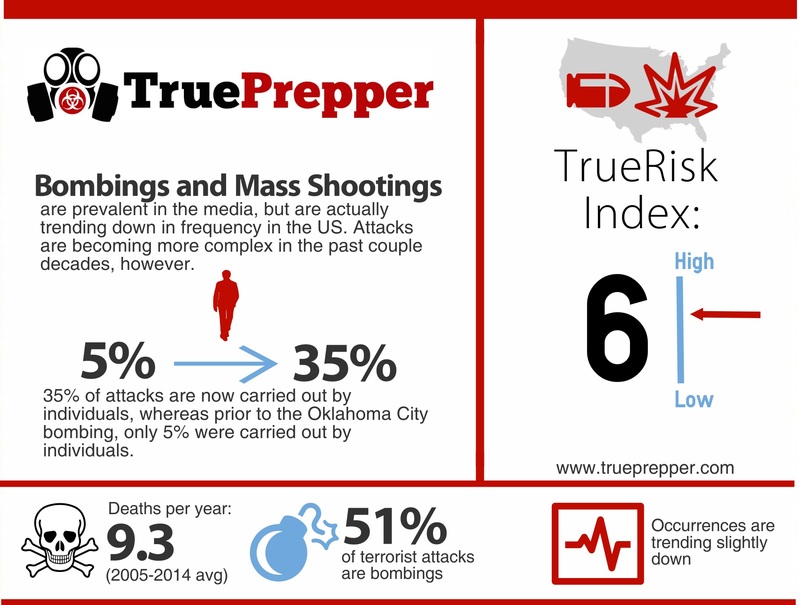 A bombing or mass shooting risk registers as a 6 on the TrueRisk index. While the world has been adapting to this evolving threat, the risk is still apparent with each and every attack we witness. It seems as if not population group is off limits, as various religions, ages, and countries have all been victim throughout the last decade. Bombings and mass shootings are very unpredictable, but you are most likely to encounter them when out and about. The deadliness of these attacks and the effect on society raises this TrueRisk score to a relatively high level. Your plans and kits will need to be mobile oriented. Most of these events occur in public places when you would be out and on the go. Being prepared while you are mobile is much harder, especially if you travel through airports or other security areas. Basic situational awareness is the best plan for avoiding or preventing bombings and mass shootings. Understanding your situations and the threats you could be presented with. Scanning rooms on entry for exit points, blind spots, things that don’t belong, and suspicious people are all good situational awareness practices. Stay sharp and keep your head on a swivel. When a bomb goes off, there is not much to do except immediately seek cover and then escape the area. You should assist others if you are able. During a mass shooting, you will want to escape first, and seek cover second. If you are in an open area do not run in straight lines- make yourself a difficult target by ducking and weaving. If you have an opportunity to rush a shooter during a reload or when they have their back turned, do not hesitate. Shooters often do not expect resistance in these scenarios and can be caught off guard. If you carry a concealed weapon, use your training. Shoot from behind cover and be sure to know what is behind your target- you do not want to add to the casualty list. When the dust settles, do not let your guard down. It is becoming more commonplace for terrorists to have secondary devices and events targeting responders to the first incident. Seek medical attention if needed, and if the event was a bombing be aware that you very easily could be suffering from a concussion. The blast can cause concussions and long term traumatic brain injury (TBI) and chronic traumatic encephalopathy (CTE) even if you are not injured otherwise. Stay informed and know what resources are available to you, and assist by providing information to help apprehend suspects if they are not yet caught.